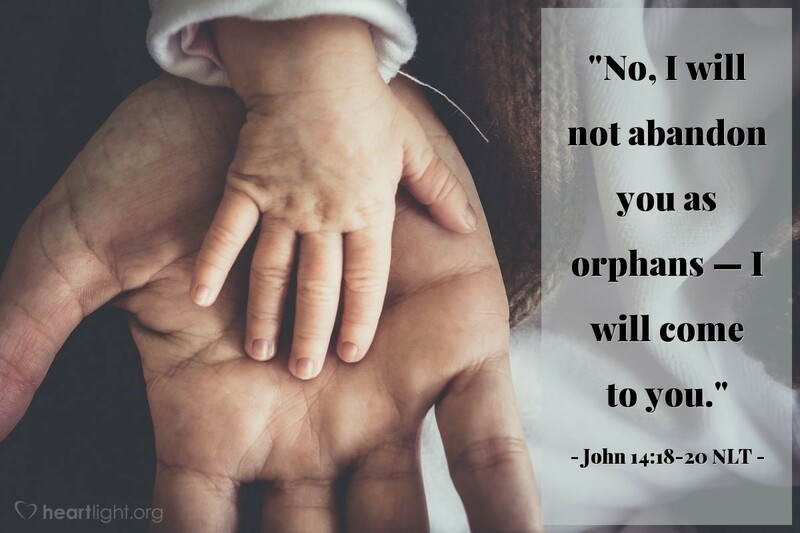 [Jesus said,] "No, I will not abandon you as orphans — I will come to you. Soon the world will no longer see me, but you will see me. Since I live, you also will live. When I am raised to life again, you will know that I am in my Father, and you are in me, and I am in you." Jesus' return to the Father is essential. He is going to prepare a place for us. He is at the Father's side to intercede for us. However, even though he has gone to the Father's side, that does not mean he has abandoned us. Jesus sends the Holy Spirit to be God's presence inside us. We are not alone. Far from it! We have the Holy Spirit in us as the abiding reminder of Jesus' victory over death and his ascension to heaven with power! Your grace, dear heavenly Father, is really beyond my comprehension to grasp fully. I know even now, as I pray, your grace makes my prayer significant because the Holy Spirit intercedes for me according to your will. Father, when I find myself in difficult times, I confess that I sometimes try to rely too much on what I can do because I get to feeling that no one is there helping me. Please, dear Father, don't just forgive me but remind me of your abiding presence in me through the Holy Spirit. In Jesus' name, I pray. Amen.